David Sheperd, the former England umpire, has died after a long battle with cancer. He was 68. Shepherd was a renowned international umpire and officiated in 172 ODIs, including three consecutive World Cup finals, and 92 Tests between 1983 and 2005. His good-humoured approach to officiating and quirky superstitions - most notably his 'jig' when scores reached 111 or a multiple thereof - made him a favourite with players and spectators the world over. Shepherd was appointed a first-class umpire in 1981, and made his international debut at the 1983 World Cup. He would go onto become one of the game's most decorated and beloved officials. Only Steve Bucknor and Rudi Koertzen have stood in more Tests. His last Test match was between West Indies and Pakistan in Kingston in June 2005 - after which Brian Lara presented him with a bat inscribed with a message thanking him for "the service, the memories and the professionalism" - and his final county appearance came at his former home ground of Bristol. Shepherd had represented Gloucestershire as a batsman over a 14-year career, which included 282 first-class matches and 12 centuries. Upon his retirement from umpiring, Shepherd returned to Devon and remained involved with his local club. He married Jenny, his long-time partner, in 2008. In confirming his passing on Wednesday, a statement on the Gloucestershire website spoke of Shepherd's "cheerful west country approach." "He was respected by all with whom he came in contact, especially the international players whom he encountered in so many Test Matches," the statement continued. "He always brought a smile to all our faces. For him cricket was a lovely game, a simple game and a game to be enjoyed. He himself brought so much enjoyment to so many of us." One of the first personal tributes to come in was from his long-time colleague, Dickie Bird. "I feel very saddened this has happened," Bird told Sky Sports. 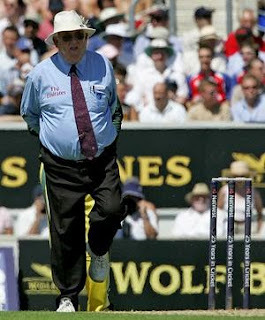 "He was a fine umpire, we spent many happy hours together. He was a great man and a tremendous man to umpire with. He was a good bloke, he'll be sadly missed." ICC President David Morgan called him a true gentleman of the game, a match official of the very highest quality with an immense positive influence on the sport. "The example he set as someone who took the art of umpiring very seriously while also enjoying what he did immensely will leave a lasting legacy for the game," Morgan said. "He was an engaging character which meant players and other umpires were always delighted to be around him." The current international umpires issued a statement saying many were indebted to him. "Every time we see Nelson on the scoreboard, we will be thinking of Shep's little jig and saying a quiet 'thank you' for having him as one of us. As Shep would always say to every umpire he worked with on the way out to the middle, we now say to him: 'Good luck mate, and may your God go with you.'"